French (Love) Friday is hosting one last dance before monsoon season arrives. The night will open with the Big Bag Band and The Marionette for Burmese rock ’n’ roll. After, the music will take a turn toward deep house with the French DJ set Krono. Tickets are 8,000 kyats each and include two free beers. 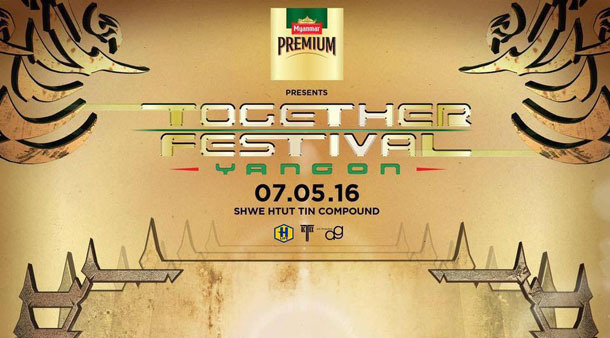 For DJ lovers, local and international DJs will make Rangoon come alive with a dynamic music performance on Saturday called Together Festival 2016. Regular tickets are each 45,000 kyats and VIP tickets are each 120,000 kyats. 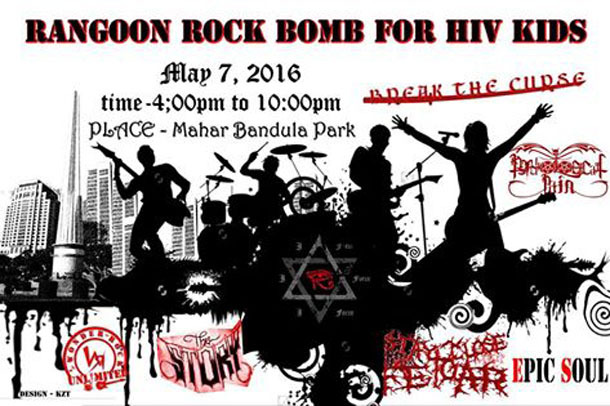 A fundraiser will be held in downtown Rangoon for children living with HIV. Seven rock bands including The Story, Break the Curse, I-Force, Wonder Rock, and Psychological Pain will all be performing in a collective effort to raise funds for the children. 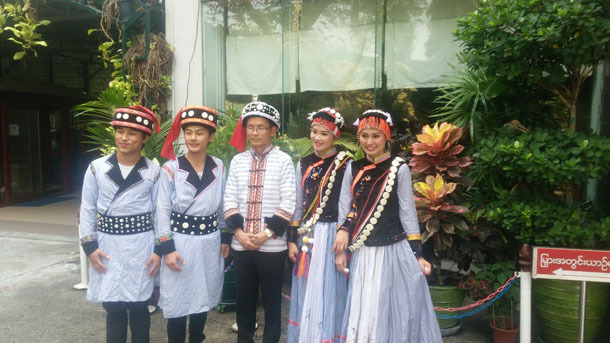 A show consisting of traditional Lisu music, dancing and costumes will take place on Friday. Admission is free of charge, but donations can be made at the show, and all proceeds will go toward displaced persons in Kachin State. The event will aim to help raise awareness about and preserve Lisu traditions and culture. 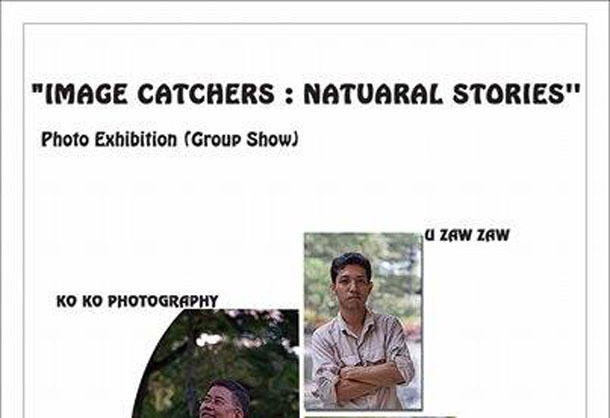 Where: National Theater on Myoma Kyaung Road, Dagon Tsp. Seventeen artists will display their work at Lokanat Galleries. 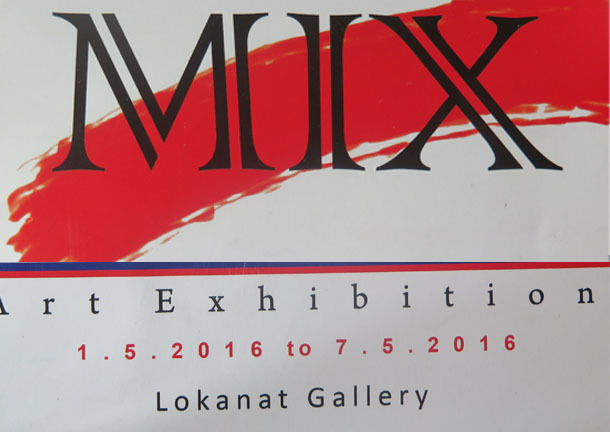 Titled “Mix,” the art exhibition will feature 74 paintings, ranging in price between US$50 and $600. 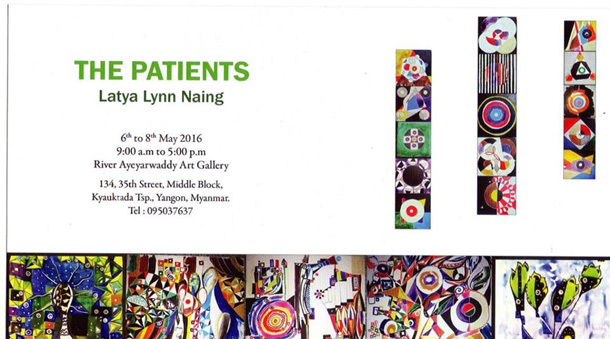 Latya Lyn Naing will display his fourth solo exhibit at the River Ayeyarwady Gallery. The show, “The Patients,” will showcase 76 paintings, ranging in price from $25 to $100. The second solo show of Kachin artist Brang Li will be held at Nawady Tharlar Art Gallery. 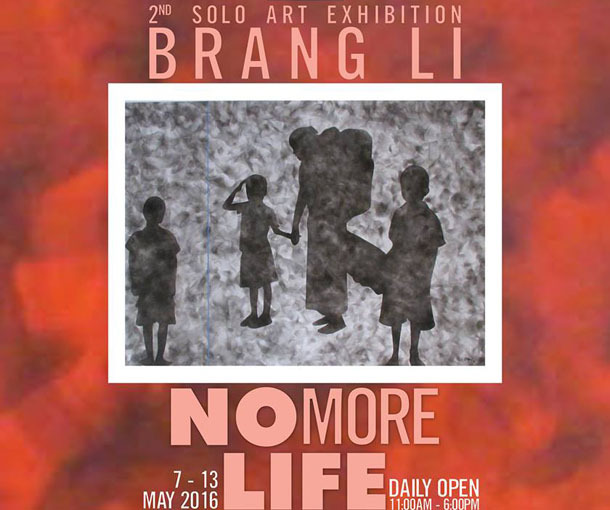 Titled “No More Life,” his solo show features around 20 paintings about the impact of civil war in Burma. The prices of the paintings range between $800 and $1,500. “The Captured Stories of Nature” will display about 90 photographs from nine photographers at Summit Gallery. Photographs will range in price from 70,000 kyats to over 100,000 kyats. The proceeds will go to various social organizations. 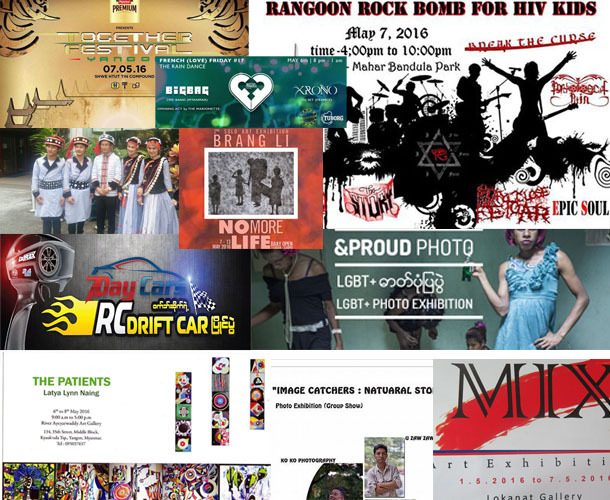 The third &PROUD photo exhibition will show photos of Burma’s lesbian, gay, bi, transgender and queer (LGBTQ) community. The competition will display photos from 12 photographers, totaling over 70 photos, as well as an intimate look at the queer community through selfies that were submitted for the selfie competition. This year will also showcase a series by Vlad Sokhin called “Being Gay in Papua New Guinea,” a photo documentary of the lives of a group of gay and transgender people living together in a small coastal village near the capital of Papua New Guinea. The opening event will include two short films on Papua New Guinea and the announcement of the photo competition winners. Where: Myanmar Deitta on 44th Street (Lower Block), Botataung Tsp. 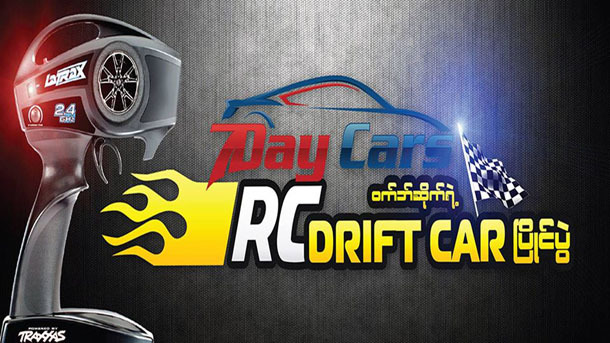 Organized by 7Day Cars, a demonstration of r/c drift racing and drone flying will be held on May 7. Anyone with r/c drift racing experience can take part in the race, but the number of contestants will be limited. Those wishing to participate in the competition can apply by May 3 at the 7Day Cars office, located at the Diamond Center, building No. 497 first floor, Kamayut Tsp. First prize is 500,000 kyats. Where: Junction Square Water Fountain Area, Junction Square, Kyuntaw St.